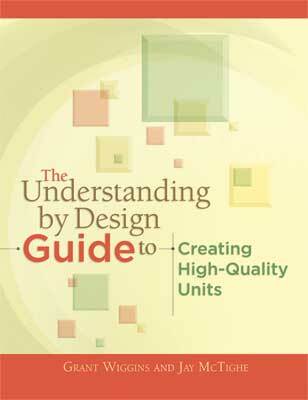 The Understanding by Design Guide to Creating High-Quality Units offers instructional modules on the basic concepts and elements of Understanding by Design® (UbD™), the "backward design" approach used by thousands of educators to create curriculum units and assessments that focus on developing students’ understanding of important ideas. A list of resources for further information. This guide is intended for K–16 educators—either individuals or groups—who may have received some training in UbD and want to continue their work independently; those who’ve read Understanding by Design and want to design curriculum units but have no access to formal training; graduate and undergraduate students in university curriculum courses; and school and district administrators, curriculum directors, and others who facilitate UbD work with staff. Users can go through the modules in sequence or skip around, depending on their previous experience with UbD and their preferred curriculum design style or approach. Unit creation, planning, and adaptation are easier than ever with the accompanying downloadable resources, including the UbD template set up as a fillable PDF form, additional worksheets, examples, and FAQs about the module topics that speak to UbD novices and veterans alike. Get this title at a discount when you buy it as part of a two-book set that includes the companion book, The Understanding by Design Guide to Advanced Concepts in Creating and Reviewing Units. JAY MCTIGHE brings a wealth of experience developed during a rich and varied career in education. He served as director of the Maryland Assessment Consortium, a state collaboration of school districts working together to develop and share formative performance assessments. Prior to this position, Jay was involved with school improvement projects at the Maryland State Department of Education where he directed the development of the Instructional Framework, a multimedia database on teaching.